The Australian Greens are a political party based on four key principles: ecological sustainability, grassroots democracy, social justice and peace and non-violence. 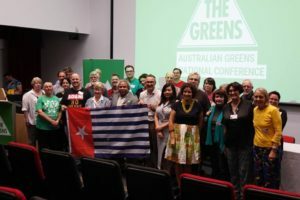 Longtime advocates for protection and self-determination, the party launched Australia’s chapter of the International Parliamentarians for West Papua in 2012. Following the historic West Papuan People’s Petition signed by over 1.8 million people, Leader of the Party, Senator Richard Di Natale put forward a motion to appeal to the Australian senate to support West Papuan self-determination last October. The motion was denied. In another step to further the advocacy work on behalf of their Melanesian neighbors, the party officially endorsed a resolution on West Papua during their national conference in Brisbane on May 20, 2018. – Requests that foreign journalists access to West Papua be opened. As a result of a workshop / presentation held at the National Conference, a consensus-approved Green Australia Member to approve an urgent resolution of West Papua.